DemoCurmudgeon: Ryan opponent Nehlen broke two election laws like a good Republican!!! 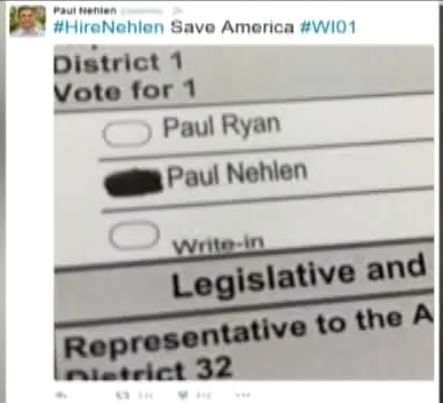 Ryan opponent Nehlen broke two election laws like a good Republican!!! WISC: Supporters of the man running against House Speaker Paul Ryan in Wisconsin's 1st Congressional District were putting up signs at polling places Tuesday during the primary election, an official said. Janesville City Clerk Dave Godak said it's against state statute for political signs to be posted on the property where election polls are taking place, and it's against city ordinance to put the signs on the terrace. Godek said the signs were improperly placed by Nehlen supporters at six of the city's 10 polling locations but that the issue has been resolved. The Paul Nehlen campaign is questioning whether the clerk has evidence that the signs broke the law. Nehlen spokesman Noel Fritsch responded to the complaints by saying, in part, Ryan's "dwindling network of supporters is carrying out the Speaker's orders to prevent Mr. Nehlen and his supporters from carrying their message" to voters. State law bars any voter from showing "his or her marked ballot to any person or places a mark upon the ballot so it is identifiable as his or her ballot" ...A spokesman for the state elections commission, Reid Magney said the Elections Commission lacks the authority to prosecute violations of the law … it would be up to a district attorney to determine whether to file charges. A call to the District Attorney's Office in Walworth County, which includes the Delavan area, was not immediately returned Tuesday night.